Newton 3 : The 2D physics engine for After Effects. 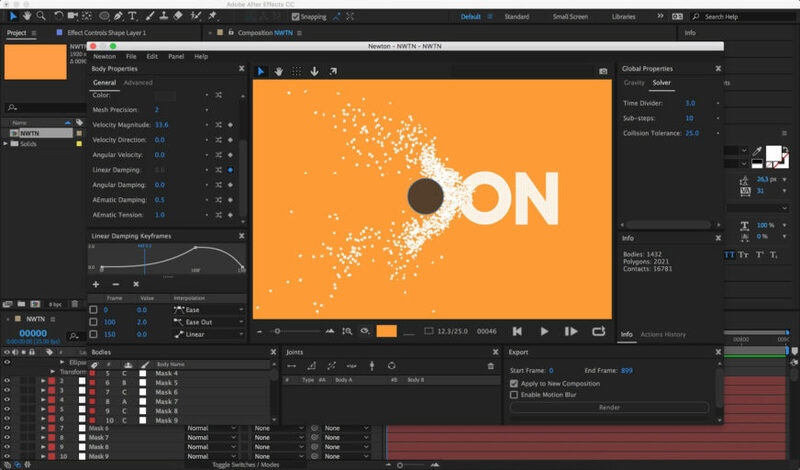 Newton 3 brings realistic physics to After Effects, making your 2D composition layers act like solid objects that interact with each other – just like in the real world. It gives you many ways to control the properties of your objects, including type, density, friction, bounciness and velocity. You can also change world properties, like gravity. What’s more, Newton 3 allows you to create realistic joints between objects, so you can easily create complex motion. Once you complete your simulation, the animation is recreated in After Effects with standard keyframes, so you can adjust the timing however you choose. Easy, no? Add 3D effect to your scene when simulation is done. Turn every object into an attractor or a repulsor. ■ Make your objects bouncier, give them more friction. Change their dampening. Activate / deactivate joints over time. Turn motors on or off, change the rotation speed. And more… The possibilities are endless! With built-in infinite floor and comp bounds. ■ Simply select the object that you want to export the contacts for, check the option inside Newton, and voilà! Once the simulation is done, you’ll get keyframes where there were contacts. ■ Our CONNECT LAYERS script gets on really well with Newton 3 – it’ll help you create ropes and much more. ■ Use the JointViz script included in the package to easily recreate Newton joints with AE shape layers (requires CC 2018 or later). ■ We’ve polished the interface so it matches that of After Effects (and looks pretty). ■ There’s better support for shape layers. ■ You’ll find a new registration system too – a single plug-in file for both the trial and the full versions, which you can activate/deactivate by using the aescripts licensing framework. ■ We’ve improved the installation process for Windows (dependencies load better, no installer required). ■ Actions History lets you undo/redo what you’ve done in an instant. ■ Preferences and Shortcuts dialogs. ■ A comprehensive User Guide for all your questions. ■ Many sample projects to get started in no time, including all the projects made for the gifs shown in this page.